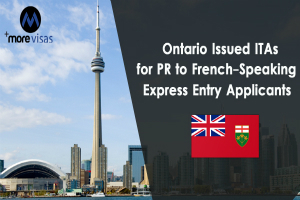 Ontario has announced new invitations to appeal for a provincial nomination for PR to applicants of French-speaking Express Entry. The 61 ITAs have announced on Feb 7 through the stream of French-Speaking Skilled Worker immigration Ontario. This stream gives the Ontario Immigrant Nominee Program (O.I.N.P) choose French-speaking applicants in the Express Entry-controlled Canadian Experience Class or Federal Skilled Worker Class who have excellent English skills and qualified skilled work experience, with other criteria. The system of Express Entry is Canada’s primary source of skilled international labor and controls the candidates' pool for the Canadian Experience Class, Federal Skilled Worker Class, and the Federal Skilled Trades Class. Qualified applicants are ranked in the pool of Express Entry depends on a score given for factors including education, age, skilled work experience and knowledge in French or English and a fixed number of the highest-ranked are invited to appeal for Canada PR by general invitation rounds. Express Entry applicants with a provincial nomination are announced an extra 600 points toward their ranking score, definitely ensuring an invitation to apply for Canadian PR. · Second one is it does not need the least score of Comprehensive Ranking System to be eligible. Applicants, however, should be able to know, write, read, and speak French at a Language Benchmark of Canada 7 and have a C.L.B of 6 in those same 04 skills in English. The Feb 7 draw French-Speaking Skilled Worker succeeded an earlier one on Feb 1 in which issued only 29 ITAs for a provincial nomination. Ontario has now announced a sum of 189 invitations to apply by the Stream of French-Speaking Skilled Worker in 2019.